I´ve been visiting The Worms (my dear parents) and today had a hospital appointment. Thankfully i didn´t have to have an operation today, but what really helped me to stay calm was taking some time out to really focus on the moment. moment by moment. one step at a time. 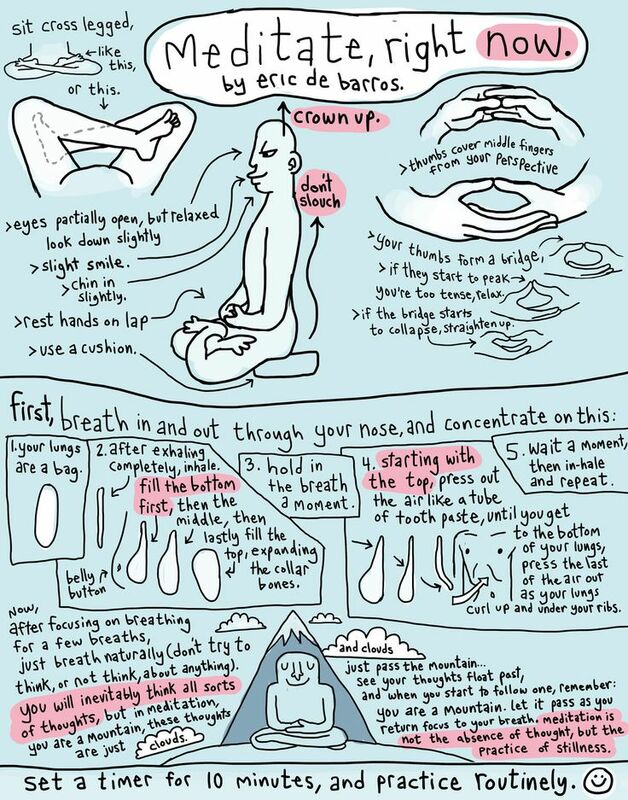 you can call that meditation, or breathing consciously or living or whatever, but if you´re not used to practicing being a spacemaker, i highly recommend it. if you ever feel anxious or scared or overwhelmed, try your best to take a step back and focus on the small things. like your breath. without trying to change it, but instead just observe it. count it (cycles of 10 works for me!) sit with it. or lay down if that feels better. just try to allow yourself to be in that moment, with whatever is going on. Often as humans we want to know it all, be in control of things and anything that upsets our equilibrium can throw us right off. instead may we create space in moments that don´t feel very spacious, and breathe. and be. much better energy spent, yeah! remember, it´s a practice, so don´t worry if you get distracted, you can always start over. and here´s a little infographic thanks to Eric de Barros – so NICE. This entry was posted in health, lifestyle, meditation, news, schedule and tagged anxiety, Brighton, brighton yoga, eric de barros, meditation, space is the place, spacemaker, Studio iO, sun ra, yoga. Bookmark the permalink.